Building a readership is one of the core goals of blogging. However, it takes a lot more than just writing amazing content—it’s about making connections and showing the world that your blog is worth reading. Keep in mind that there is probably a surplus of quality bloggers in the same niche as yours. In fact, you may not even be the best blogger in your field or industry. 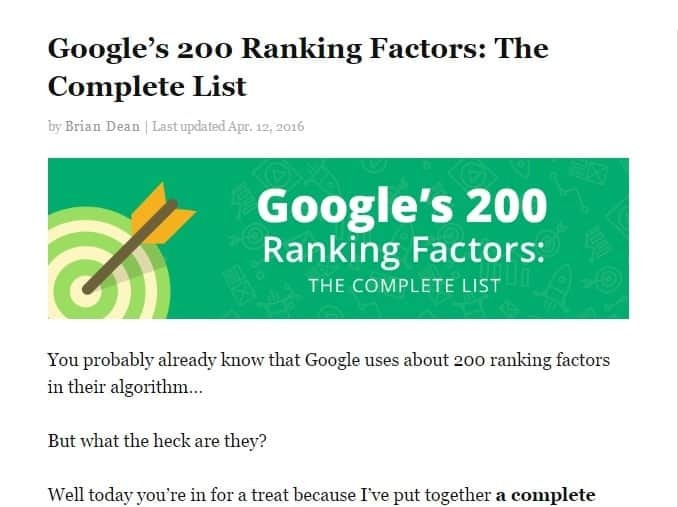 So if you want to win more readers, you need to focus on building trust and gaining exposure from targeted traffic channels such as the first page of SERPs (Search Engine Results Pages) and other authoritative blogs. Why Do You Need to Do Blogger Outreach? Imagine you’re planning a huge party in an amazing venue. You shouldn’t assume that droves of people will attend just because you spent a boatload of money on food and decorations. Remember that you still need to promote the event and send out the actual invitations. Sure, you can invite your close friends, which is a few people guaranteed to arrive. But if you want to attract a large crowd, you need to invite popular people and leverage their network. When holding a party, you invite the cool and popular kids so they will do the inviting on your behalf. Since cool kids in your school have the influence that you do not have, there is a great chance that a lot of people will attend your party. The same concept applies to your blog — you need to be in the good graces of popular bloggers so they can influence their readers to follow your blog. The question now is: how are you supposed to do that? In blogging, these are the influencers with an established readership. That’s where blogger outreach comes into play. 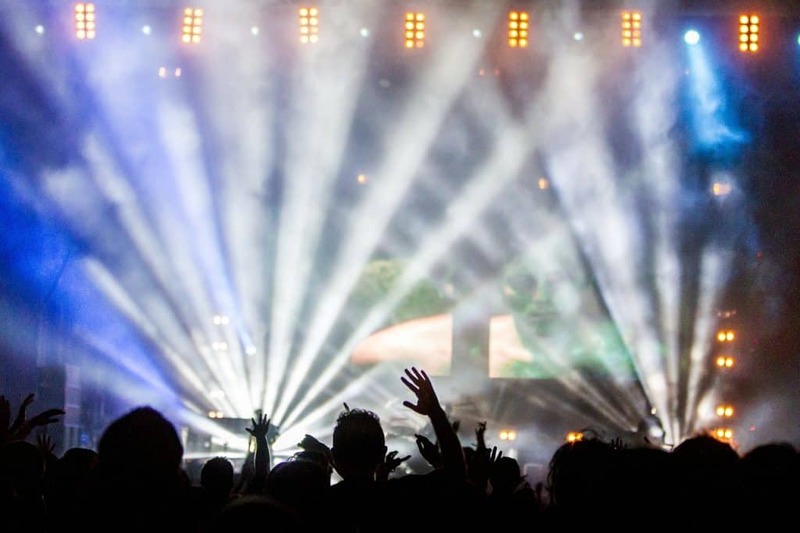 Say, if you want to bring a thousand people to your site, you connect with at least five bloggers with an audience base of 200+ each rather than send a thousand invitations by yourself. On top of the added exposure, people will be more willing to trust your blog as much as they trust the influencer that linked to you. In blogger outreach, however, a simple invitation is not enough to bring influencers to your cause. You also need to offer value in your proposition and show them that your blog is worth mentioning. But first, you need to plan your method of approach. Unfortunately, this leads to the biggest criticism in blogger outreach. Blogger outreach took the online marketing world by storm a few years back. Not only is it effective for bringing people to your blog, but others also used it in link-building to earn higher rankings in search engine results. But as the practice gained popularity, the real essence of outreach was lost in a scramble for the most valuable connections. 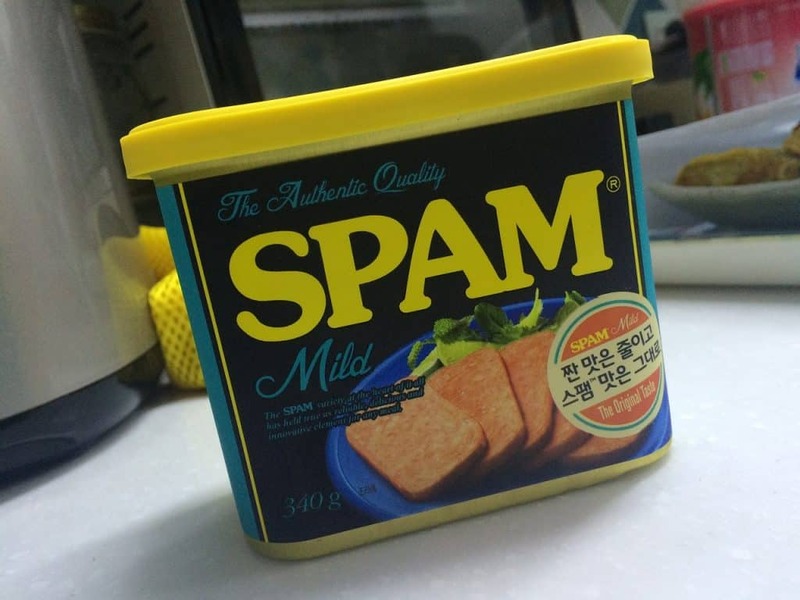 Keep in mind that there is a fine line between “outreach” and just “spam”. Plenty of bloggers and marketers crossed the line by utilizing templates and relying too much on outreach automation tools to build connections between them. 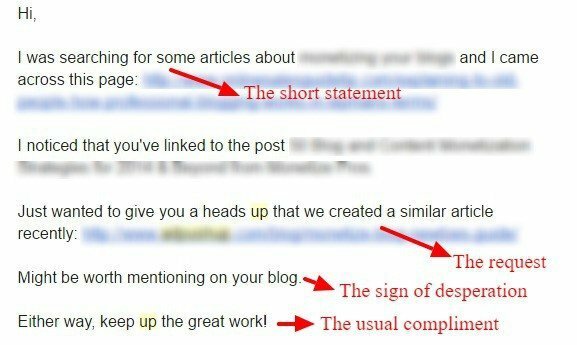 Regardless of how great the content you are trying to promote is, approaching your blogger outreach without a clear strategy is the spammy way to go. Of course, blogger outreach tools can still be useful in the right hands. In fact, some of these tools will be mentioned later in this article. However, a lot of inexperienced marketers use them as an excuse to turn “outreach” into “sending a bunch of emails and hoping to get a response.” As a result, influencers are more compelled to decline since they know there’s nothing in it for them. Keep in mind that it’s not a reliable strategy to focus only on the most popular influencers in your niche—especially if you’re just starting out. These “big name” influencers probably receive tons of outreach emails a day, so there’s a small chance that they’ll even open your email before their virtual assistants delete them. On the other hand, targeting the “newbies” in your industry is a strategy you don’t want to keep for the long haul. Since they don’t receive a lot of requests from other bloggers, they are the ones who will most likely read and respond to your outreach email. But due to their limited follower base, they’re only good for giving your blog a small increase in traffic. Determine the criteria for the type of influencers you want to reach out to receive the best results for your blogger outreach campaign. What you want is to target the “guru level” influencers with a decent amount of readership and social following. Although they may have virtual assistants, there’s still a reasonable chance that they’ll read your outreach email. They also tend to respond well to valuable outreach propositions since they also seek growth for their blog. Always remember to treat your target influencers differently. You need to personalize each outreach email specifically to each influencer to give them a sense that they’re being contacted as humans. 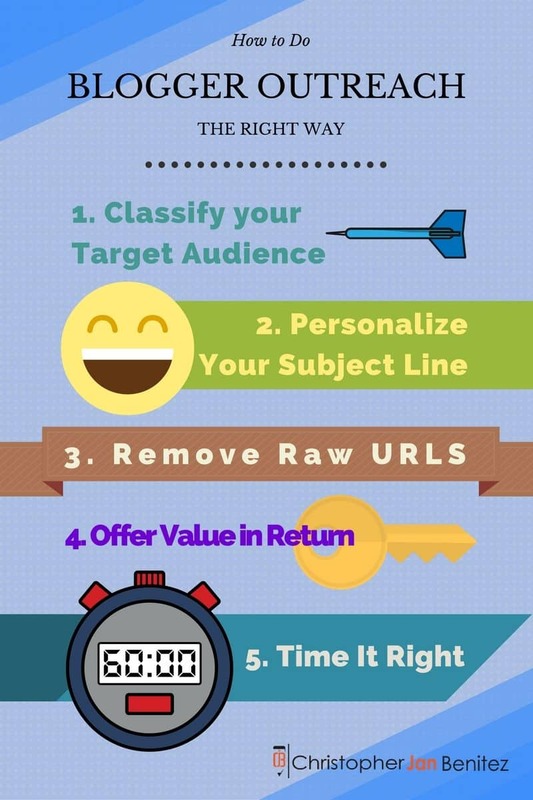 First, make sure you create a personalized subject line to make the email stand out in their inbox. Whatever you do, avoid using a compliment as a subject line as it immediately raises a red flag. Remember that no one crafts an entire email just to give a compliment. Instead, you need a subject line that’s straightforward yet lacking at the same time. Give just enough information to pique their interest and compel them to read the entire email. In other words, never give it all away from the beginning. For example, if you want to be linked from a blog on web design, you can use something like: On-Page SEO at web design blog. At first look, the influencer will know that the email is about a “web design blog” and “on-page SEO.” However, they can never be sure if it’s an agency giving an SEO audit for their blog, a blogger trying to put together tips from experts, or a reader inquiring about a particular area of web design. Simply put, a raw URL is a good indication that an email is constructed using a template or an outreach software. Remember that you need your target influencers to feel more than just a name and email address in a spreadsheet. They deserve more than just emails that contain copy-pasted links content and links. If you’re trying to refer to another post they did in the past, it’s not a good idea to post a link to it either. You can just refer to it naturally like “a blog post about responsive design a week ago”—the influencer will get it. A common mistake that bloggers make during outreach is to promote a post just because it is “similar” to what the influencer has done or linked to in the past. Why? Because there’s no point of sharing something that they’ve already seen before. Instead, you must highlight that the post you’ve written includes details they may have missed, corrected mistakes they’ve made or exposed the subject from a whole new angle. That’s how you offer value to your target influencers. …and made a better version of the same content in his blog. Brian was able to add value to an already valuable post by making the layout much more pleasing to the eyes and providing more SEO factors than the original post. After reaching out to bloggers in the promotion of his post, Brian enjoyed a 17% rate of bloggers linking back to his site. In other words, make sure the outreach email focuses on what the original post didn’t have. If they want to be an authority on the latest news and thorough knowledge in any subject matter, then they will surely appreciate your effort in supplying them with new information. As long as your content adds value to what the influencer already has, you may have even your very own software or product. Lastly, remember that timing is very important for a successful blogger outreach strategy. While it’s a good idea to reach out to influencers just hours after they post a new article, they probably won’t work on an article they’ve already updated recently. Instead, they will focus on something else entirely, and it will take weeks for them to get back to the post you’re interested in. If you contact them too late, your outreach email will be buried deep in their inbox by the time they’re interested in taking suggestions. That’s why you need to look for content that’s posted only up to a day ago or find something a few months back. Either way, you need to use tools that enable you to filter your content research according to date. Finally, it’s time to familiarize yourself with the tools you need for a productive blogger outreach campaign. Bear in mind that even after learning everything you can about blogger outreach, you could still be left not knowing how to get started. That’s why you need to start by building your toolset and learning how to use them. An indispensable tool in any blogger outreach campaign, BuzzSumo lets you identify influencers and their most popular content. Once you have subscribed for an account, go to the Influencers > Twitter Influencers tab type your keyword in the search bar. The results will show you the different influencers related to the keyword you entered. On the right side of the results are factors that will help you determine the influencers you should target for your blogger outreach strategy. Page Authority – If there is a link to a page included in their Twitter Bio, BuzzSumo will show its Page Authority, which determines the trustworthiness of the page based on Moz’s algorithm. The higher the score, the better. Domain Authority – Similar to Page Authority, Domain Authority refers to the trustworthiness of the domain and not just the page. Followers – Counts the number of followers the influencer has. The more followers the influencers have, the more reason you should reach out to them. Retweet Ratio – Rate that influencers retweet the tweets of others. These metrics will help give you a better idea of the influencers in your niche. Assuming that BuzzSumo will show hundreds of results (which it probably will), you can filter out the type of influencers you want to see. You can further filter your list by determining the criteria for the factors listed in the results. For example, you want to reach out to influencers with at least 10,000 followers, 5% retweet ratio, 5% reply ratio, five average retweets. This way, you have a chance of striking a connection with the influencers (based on the reply and retweet ratio) and get more people to learn about your latest blog posts (assuming that you got the influencer to share your post on their social media). 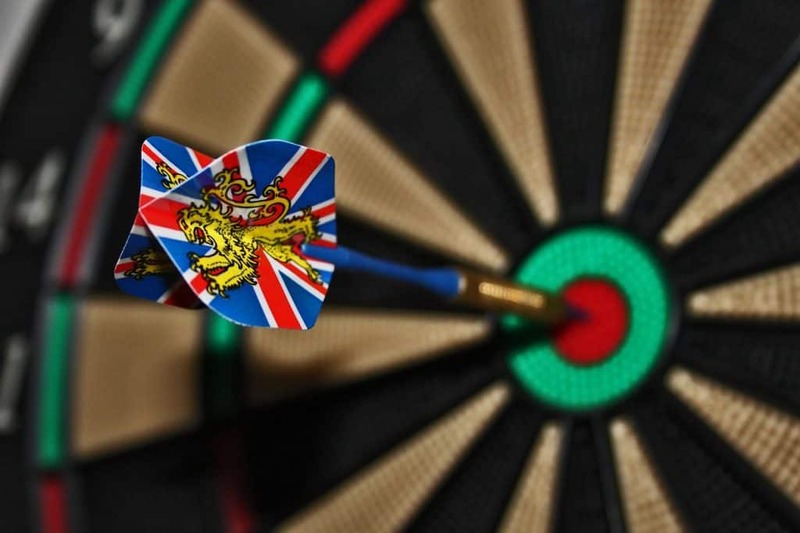 Tick the box of influencers whom you want to target. Once done, you can save the influencers in a list. You can export the list by going to Influencers > Outreach Lists tab if you want to refer to the list offline or upload to a different platform. Take note that BuzzSumo is designed specifically for content research. It helps you siphon topic ideas and popular content formats in a specific industry. It also analyses content from the most popular bloggers and content sources, which is why it can be used to identify key influencers in a particular niche. Using BuzzSumo for content research about blogger outreach, you can view the links shared by the influencers. You can also analyze the links shared by the influencers. Having both data at hand, you can determine the kind of posts that you need to share to get a reply or retweet from them. If you have no content under their favorite topics, you can use the links shared to create a much better post on your blog (taking the cue from Brian Dean). Disclaimer: Any link that points to Ninja Outreach in this post is an affiliate link. If you click and make a purchase from that link, I will earn a commission from every sale. If you like even to learn more about the plugin, click on the link above or this one (also an affiliate link) for more information. Ninja Outreach is your one-stop shop when it comes to connecting with influencers—regardless of where they are in the globe. In a way, Ninja Outreach is a cheaper alternative to BuzzSumo if you cannot affordable the high price range of the latter. Granted, there are features in BuzzSumo that are not available in Ninja Outreach (more on this later), but let us focus on what it can do instead. Once you have signed up for an account, log in to access your dashboard. From here, you can search prospective influencers from the tool using your target keywords. There are two ways you can do this. If you want to see authoritative and popular sites that feature content related to your topic, search for your keywords on Content Prospecting. These can help you determine the list of sites that you should reach out to with your blog post. Ideally, the metrics will help you find sites where you can get a backlink from with your post. You can filter the results so you can target particular sites based on the filters you have set. You can then save the selected sites in a list for outreach later on. If you are looking for influencers creating and sharing content about your topic, search for them on Social Prospecting. The results are pretty straightforward. It shows the number of Twitter followers that the influencer has, followed by the website that you can refer to when reaching out to this person. 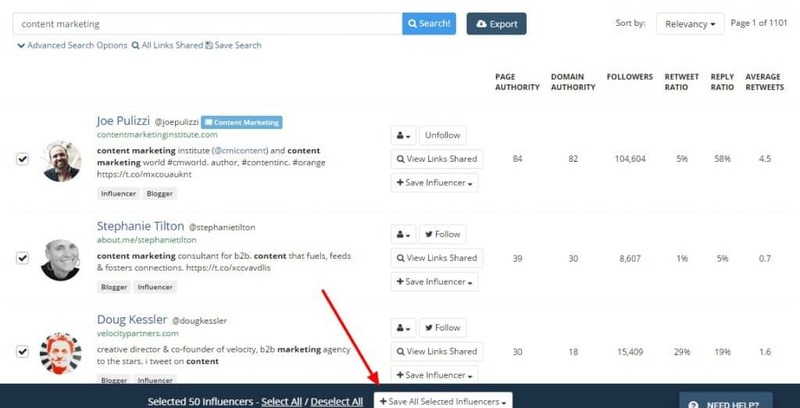 You can also filter the results based on the location and the tags (blogger, executive, and more) of the influencer. Once you have found the people you need to reach out to, you can save them in a list. You can further narrow down your list by selecting the prospects from the list that you want to target for the blog post you are promoting. 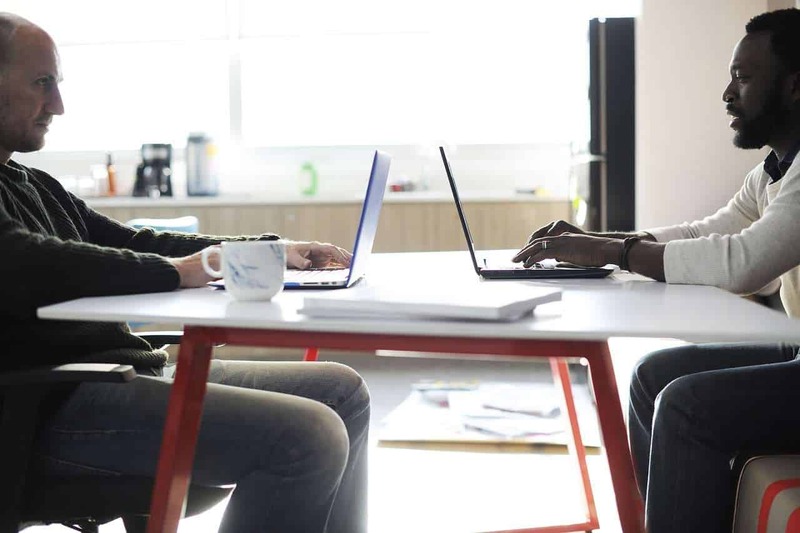 You can add them to the list of prospects and refine your current relationship with them (shared post on social media, left a comment on their site, and more). Labeling your relationships with influencer allows you to keep track of things you need to do to get in their good graces. Once you have at least built and cultivated your relationships with these bloggers, you can begin pitching them your blog post that they can promote on their social media or blog. First, you need to develop the template that you will send to your prospects. Go to Manage Templates to create your template. As mentioned earlier, pre-written templates are impersonal and hurt your chances of building a relationship with influencers. However, you can still make the most out of the templates as long as you edit the template by adding a personal touch to each influencer. Once you have developed your template, head on to Outreach Mode and choose the prospect that you will send emails to. 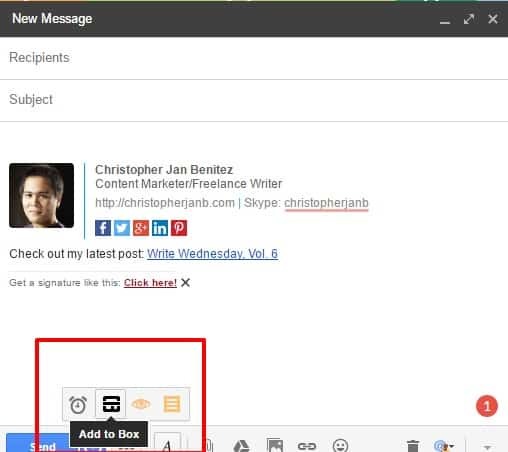 Once you have plugged in the template on the email text editor, make sure to personalize the email before sending it. If you do not know much about the person you are trying to reach out to, take your time to get to know him or her. Dedicate at least a paragraph about something that both of you share (passions, hobbies, and more). If you do not have funds to shell out for the tools above, you can go straight to looking for influencers the hard way. The one thing you need to consider using, however, is an email tool that lets you keep track of the emails you have sent to influencers. Streak, initially a CRM software specifically designed around Gmail, is a great freemium tool to use for blogger outreach. This tool is perfect for bloggers who don’t want to overcomplicate the outreach process with plenty of external software. 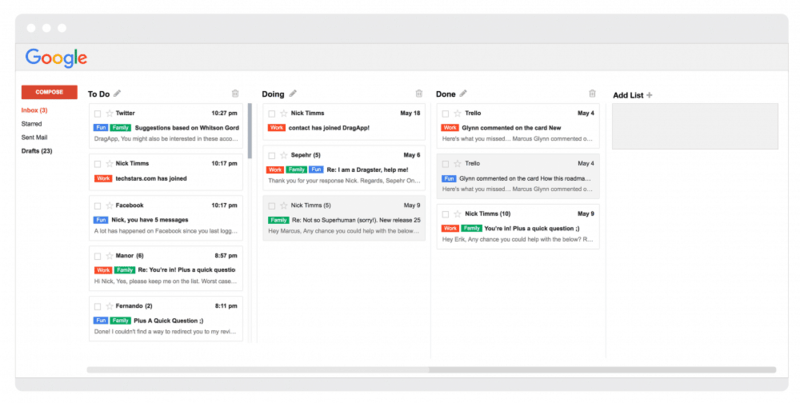 All it does is optimize your Gmail inbox for contact management. Once you sign up for an account, access your Gmail to see the difference. 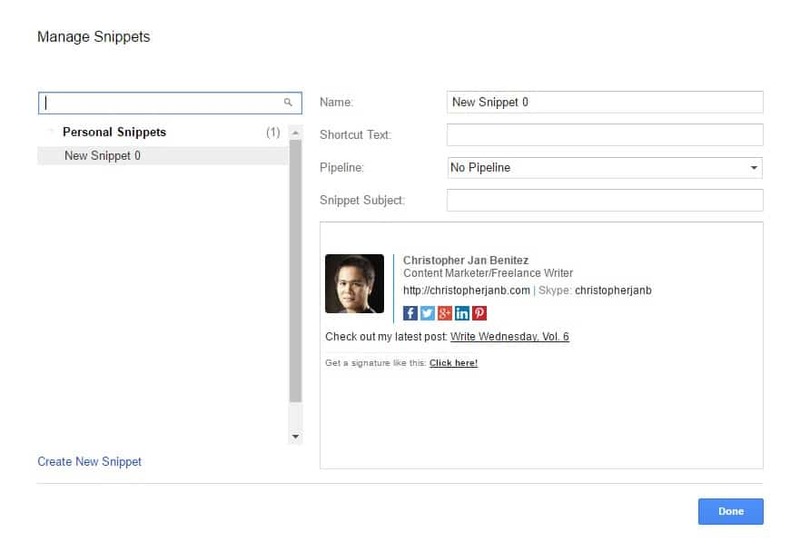 The added Pipelines option on the left sidebar of Gmail tracks the progress of individual conversations, organizes your leads according to priority, highlights messages that demand your attention, and more. Click on Dealflow to see the contacts you have reached out to so far and which stage are they in your conversion funnel. To add people in your Streak’s conversion funnel, compose a new email, enter the e-mail address of the influencer, and click the Add to Box icon below the editor. Once added, you can label the influence by adding notes and identifying which part of your conversion funnel they are in (assuming you have sent your email). If you are hellbent on sending out templates to influencers, Streak lets you create Snippets that you can send out to them to make your blogger outreach faster and more efficient. There are no templates to choose from, so you have to build your own. Also, make the email personal to each influencer – edit the message first before sending them out. Personally, I find myself using Streak more often than other blogger outreach tools. It does one thing, which is to manage your contacts in a single place, and it does it quite well. I suggest that you at least try out the tool and see if it eases the burden of blogger outreach for you. Similar to Streak. Drag helps you organize your blogger outreach strategy within Gmail. It declutters your inbox and presents your emails in a Trello-style card layout. If you feel comfortable using Trello for your project management needs, you’ll feel right at home with this Gmail extension. The tool is fairly new, but its public roadmap should get you excited about what’s in store for you in the future. Blogger outreach ultimately boils down to good relationship building. A healthy relationship, in turn, can only exist between two persons who value each other’s presence. That said, real blogger outreach begins when you stop viewing it as a marketing process and more as a way of gaining friends. If you like this post, please share the love by tweeting or liking it using the social buttons below.